In case you missed it or you’ve been living underneath a gaming rock for the last little while, Oculus announced a price and start date for shipping for its Rift VR Headset: 599$ USD and March 28th. As one can expect, the reaction was generally the same as it is with things that have been hyped a lot: “gaming company does a thing; the internet freaks out.” I could talk about the reasoning behind such pricing, why some people think it’s outrageous, why I think it’s perfectly reasonable and should have been expected, and why expectations were set differently by Oculus, but that’s not entirely what I came to write about, here… what I’m talking about is how, at least, as far as the gaming industry is concerned, the internet freaks out about damn near everything the mainstream and it seems that there’s always something to complain about, no matter how reasonable or logical it is. Do you guys remember this? 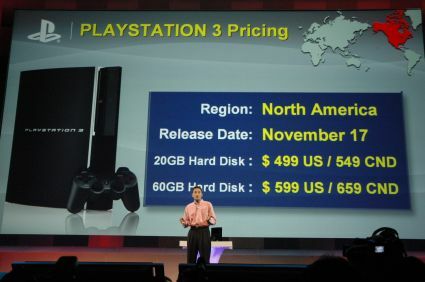 Do you remember when the PlayStation 3 was priced and dated? It was laughed about by gamers for years and Sony was chided for their decision. But it still all boiled down to one of two responses “gaming does a thing, internet freaks out” or “gaming does a thing, internet mocks for the lols.” Usually there’s a lot of the former before there’s any of the latter and, right now, the internet is doing a lot of freaking out on reddit and Twitter about this whole Oculus Rift thing. There’s a lot of people that were expecting it to be a lower price even though all kinds of media outlets were trying to tell people what to properly expect several months ago and it seems that even though Mr. Luckey is telling everyone that for what we’re getting, it’s an incredible value and that Oculus is making nil on the devices in profit, expectations were set that the price would be lower than it was announced to be. I guess the question that should be asked because I feel that it’ll get a variety of different answers is this: “What did gamers expect, exactly, from the Oculus Rift?” What do people expect from gaming, as a whole, exactly? Can someone tell me why exactly someone who is constantly disappointed by things that happen in gaming can’t simply move on to another hobby that they thoroughly enjoy? Is gaming that much of a pop culture standard that people are literally staying on the gaming pulse just to feel like they’re involved in something big and important? Are people so desperate to be a part of something that they will latch on to something that constantly causes stress, anxiety, and anger for them? Okay, Hobbes. I promise I won’t go off the hinge, here. There’s no way to really answer any of that in a certain way. 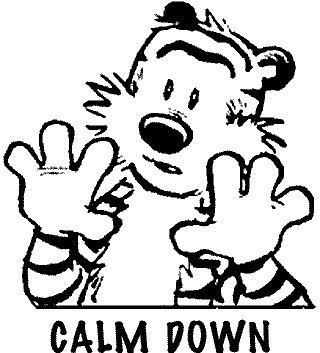 Hobbes has the right idea, though: we should all be calming down a little, I think. I think there’s a great deal of people in the industry that may need to reconsider their priorities in terms of what they do to become happy people in life. We all know it isn’t quite that easy and that’s for people that happiness might come easy for: that being said, though, it’s not always impossible. If we can’t eliminate the stress and sadness in our lives, we can do things to minimize it. If gaming is constantly disappointing you and you feel its standards are constantly misrepresenting you and your feelings towards life, then perhaps gaming isn’t quite for you. If you don’t like a certain company’s practices then you should understand that a company will only understand sales numbers and based on those numbers will continue to make decisions so you should only buy products from companies you can get behind. Here’s a story that, if you’re one of those angered by the whole Oculus Rift thing, maybe you can relate to: does anyone remember a company named Working Designs? No? I can’t say I blame you. How about Game Arts? Alright, well, that’s a little less forgivable, but I suppose I can’t blame that, either. You see, those two companies were responsible for some of the quirkiest and greatest PlayStation-era role playing games anyone’s made. Of course, the production value wasn’t entirely AAA but they knew who their fans were and they made games for their audience. They caught a lot of flak for what they did, though: most of their large releases had one setting: Collector’s Edition. You got all the swag you were bound to see outside of Japan for that game and oftentimes it was pretty awesome. While the printing seemed to hold equal numbers with their Collector’s Editions, the latter seemed to always be all that was ever available. Anywhere. Between the games they both worked on together and individually, you’re looking at probably some of the best Japanese-oriented games this side of the ocean both before anime or gaming really hit the general mainstream. When Working Designs just suddenly fell off the map due to their refusal to produce for a non-Sony console after Magic Knight Rayearth and poor all around sales, everyone was kind of shocked because their games always received critical and fan acclaim. It just boiled down to, after so long, people got bored of their stuff and moved on from the company and yet didn’t seem to understand that not supporting the company hurt it and eventually it just faded away. I was extremely unhappy to hear about this but things got even worse with Game Arts, the company that used to be about strong, original releases that eventually became the whipping boy of the gaming industry, still taking contracts for easy pay and cashing in on Grandia, still, without bringing much new to the table. I bet you can’t figure out where I’m going with this… they were a good thing that made a lot of people happy that fell off the face of the Earth because people simply didn’t support the good guys out there. People didn’t support what they enjoyed, were interested in, and loved talking about. Given, the games weren’t exactly casual-friendly but they were remarkable and everyone talked about them at the time, especially in the gaming press that had been saturated with Squaresoft-released RPGs. While that fuss was not nearly on the same scale as the Oculus Rift ordeal or anything of note that’s happened in gaming in the last five years, you also have to understand we didn’t have Twitter, Instagram, reddit, Facebook, or any of that. We were lucky to have a group of gaming buddies to chat about things with. Forums were all the rage then and, trust me, they weren’t as massive or as prevalent as they are today.